We are working on a farm preschool unit and we started the unit the way we always do, by looking through our shelves and the library shelves for books related to the topic. There are so many farm books out there but here are ten of our favorites. I Spy on the Farm by Edward Gibbs is a great book for predicting. Each page plays I spy with the reader and gives clues about the color, letter the animal starts with and sound it makes. Such a fun guessing game for young readers. Farm Flu by Teresa Bateman is a cute story about what happens when the animals at the farm get sick. The little boy takes care of the animals the same way his mom takes care of him. Then he realizes that the animals are just enjoying laying around, eating what they want and watching tv but just as he is sending them outside, he gets the flu and they take care of him. Punk Farm by Jarrett Krosoczka is not your typical farm book. In this story, the animals have a rock band that plays secretly at night when the farmer is asleep. This story follows a night at their concert and their "punk" version of Old MacDonald Had a Farm. Punk Farm on Tour by Jarrett Krosoczka is the sequel to Punk Farm. In this book, the farm animals go on tour while the farmer is away. They road trip from state to state in their run down van. Throughout the book they sing their own version of Wheels on the Bus. A funny farm story for sure! Farm Lift the Flap by Roger Priddy is one of our favorite board books. It has so many flaps inside that it keeps the girls busy for awhile. It goes through different farm animals, crops and farm equipment. Farm Feel and Find Fun was another favorite board book when my girls were younger. They loved learning the different farm animals and being able to touch different textures on each page. Farming by Gail Gibbons is a nonfiction book about farming throughout the seasons. Gail Gibbons' books are great introductions to nonfiction text. 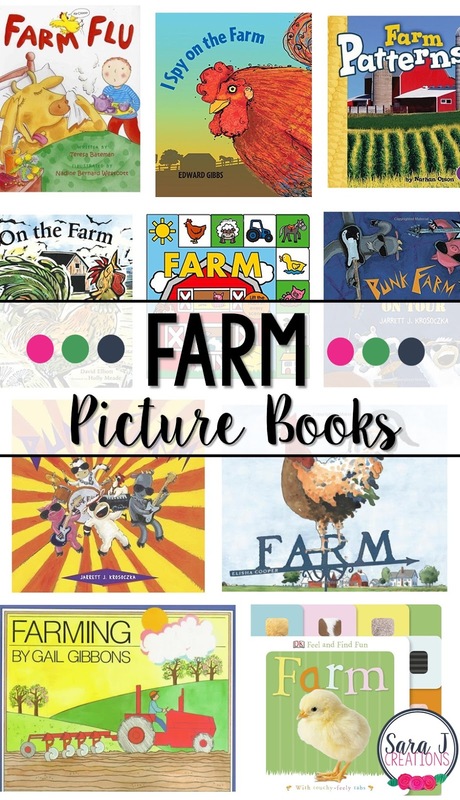 It has kid friendly pictures and text yet teaches about life on the farm. Farm by Elisha Cooper is a poetically written story about life on the farm, changing seasons and the different animals. I love the illustrations and the way it is written, but this is a long book with a lot of text, so it might be a little lengthy for young learners. Farm Patterns by Nathan Olson is a great nonfiction text that explores patterns on the farm. My oldest loves finding patterns in the world around us and this was a fun way to explore patterns on a farm. On the Farm by David Elliott is a different spin on farm animals as it is all poetry. The illustrations are beautiful and so different from the other books. Definitely a fun farm book to add to the collection.